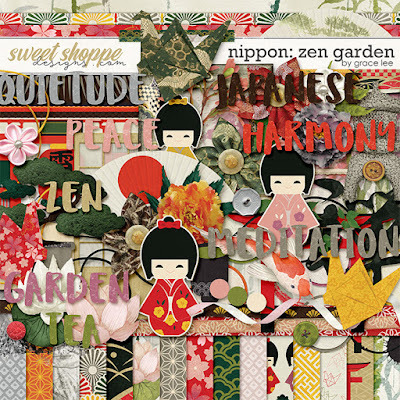 Nippon: Zen Garden is inspired by the Japanese culture. Rich colors and traditional motifs make this the perfect collection for travels to the beautiful island country, cultural events, and visits to your favorite sushi place or the local Japanese garden. and 70 elements. The elements included are: 1 bonsai, 2 branches, 4 buttons, 3 paper cranes, 4 Japanese dolls, 1 door, 2 fans, 7 flowers, 2 frames, 1 gate, 1 koi, 6 labels, 2 leaves, 1 lilypad, 2 lotus flowers, 2 mocha, 3 paint, 1 plague, 4 ribbons, 1 stamp, 1 stone lantern, 3 strings, 3 washi tape, 2 tea, 1 temple and 9 word art.